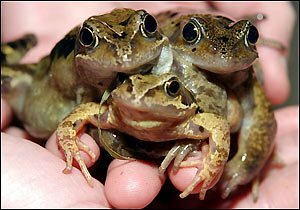 Students nationwide have started demanding that their parents get them 3-headed pets following the discovery of a three headed frog in Somerset. The frog is believed to be the result of environmental changes and was found by students hopping around their school pond. Teachers initially thought that the students had glued 3 frogs together as part of an immature prank, however extensive and determined testing by scientists has concluded that only aircraft grade superglue is strong enough to hold the frogs so tightly together and is not currently available to schools or students. 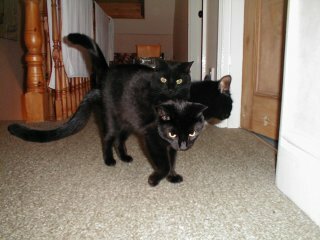 Although many of students were initially a little bit intimidated by the mutated creature, the general consensus now is that the creature is �cool� and that the children would all like a three-headed pet of their own. However, scientists predict that the scientific advancements to allow them to create such creatures could be a long time coming. The exact origin of the creature responsible for starting the craze is unknown, however a French fast food restaurant claims responsibility. As well as having 3 heads, the frog also featured 6 legs, two more than most frogs. The restaurant owner claims that by breeding a 6-legged frog he has increased the leg yield per frog by 50% and has thus cut down on his expenses.